Your general dentist sometimes refers patients for consultation and possible treatment when the diagnosis is complicated or when treatment is more difficult than normal. Aside from providing treatment, our doctor's role is also that of educators. It is important that patients understand why they require treatment, what treatment involves and what they can do to ensure the best possible outcome. Our doctors believe that a properly informed patient has the best chance of achieving the optimal result. Toothache pain is the main reason for patients seeking treatment. Fortunately, modern anesthetics can make the procedure pain free in most cases. Seeking treatment early makes the procedure more comfortable, so don't wait. When caught early, treatment should feel no different than having a regular filling. For the first few days after treatment, there may be some sensitivity to biting pressure, especially if there was pain or infection before the procedure. Sometimes over-the-counter anti-inflammatory medications (like Advil) are recommended for a day or two. Our doctors can prescribe other medications but they are rarely required. Understanding Endodontics helps when you have some basic facts about tooth anatomy. 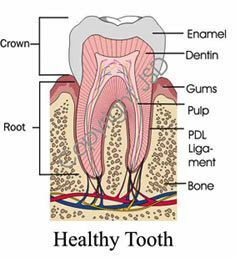 There are several layers of a tooth. The hard outer layer is the enamel. 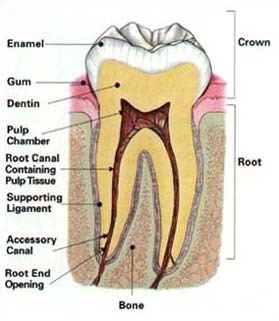 The supportive inner layer is the dentin and in the center of the tooth is the pulp which is a soft tissue. The pulp contains blood vessels, nerves and connective tissues. 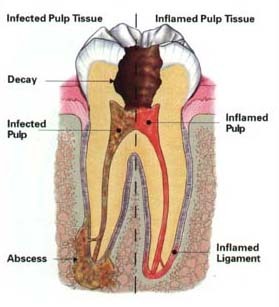 The pulp receives its nourishment from the vessels which enter the tooth at the root. The pulp is not necessary for the function of the tooth. The tooth can be nourished by the tissues surrounding it after the pulp is removed. Endodontic treatment is necessary when the pulp becomes inflamed or infected. 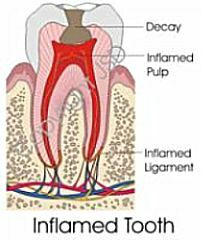 Common reasons for this inflammation or infection are cavities/caries, cracks, and trauma. If pulp inflammation and infection are not treated, it can cause pain or lead to an abscess. Signs and/or symptoms could be prolonged sensitivity to hot or cold temperatures, discoloration of the tooth, swelling or tenderness of the tooth or gums. Seeking treatment early can make the procedure more comfortable. Don't wait if you can help it! Steps of a root canal: The Endodontist removes the inflamed or infected pulp, carefully cleans and shapes the canals of the tooth, and then seals the canals. This can be done in a single appointment, depending on the complexity and severity of your case. For the first few days after treatment, you may have some sensitivity. Now that treatment is complete, we have you return to your general dentist. This should be done within 30 days of completing your root canal treatment. The restoration of your tooth is hugely important! If you do not have your tooth restored in a timely manner, the tooth can become contaminated and re-infected. The tooth needs to be sealed properly by your general dentist which protects your tooth and restores its function. After treatment: Once endodontic therapy is completed your tooth should be examined periodically, usually every 6 - 12 months. This allows us to make sure the tooth has healed or is healing properly. You will be sent a notice in the mail when we feel it is appropriate to reevaluate the area. Since an abscess may take 2 years to heal, our office will reevaluate the tooth for at least 2 years. Should you have any questions or concerns before or after treatment, we welcome you to call or visit the office. We will be glad to assist you and will do our best to ensure your comfort. There are, of course, no guarantees. Root canal or endodontic therapy has a very high degree of success. Teeth which can be treated near ideal have a success rate up to ninety percent! We will discuss with you the chances of success before any endodontic procedure to help you make an informed decision. If a root canal or endodontic therapy is unsuccessful or fails you still have options. Our endodontists work closely with your general dentist. We will work together and discuss your treatment so that we can give you the best possible options while keeping your best interests in mind.